Among the many films about World War II made in the 1960's, there are several stand-outs: 1961's The Guns of Navarone, 1967's The Dirty Dozen, 1968's Where Eagles Dare and The Devil's Brigade. 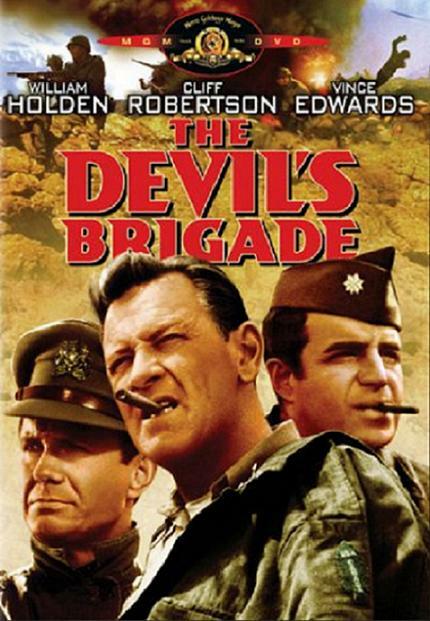 But there's something about The Devil's Brigade that sets it apart from its brethren. It's not the writing or the cinematography, it's not the editing or the film score, and it's definitely not the acting (although William Holden gives a stellar performance, as usual). What separates The Devil's Brigade from the rest is that it's the only movie of the four mentioned above that's based on fact. There were no guns at Navarone and no commando unit was sent in to blow them to kingdom come; the Allies did not gather and train 12 convicts to send them into enemy territory on a suicide mission; and MI-6 most definitely did not send in commandoes to rescue an American general from an Alpine Nazi fortress. There was a special unit, however, that harried the Germans in Italy and southern France to such a degree that a German officer referred to them as Die schwarzen Teufel or black devils (the "black" is in reference to the unit's use of shoe polish to blacken their faces before setting out on their signature night raids). The 1st Special Service Force was formed on July 9, 1942 for the express purpose of dropping into high glacier plateaus behind enemy lines in Norway to sabotage and generally harass Nazi mining operations and production factories. The unit was made up of elite Canadian parachute infantry and volunteer American enlisted men. They received training in hand-to-hand combat, mountaineering, skiing, arctic survival, stealth, amphibious assault, and demolitions, as well as parachute and weapons training. If you could combine an elite Airborne unit with a unit of British Commandoes then you may have a general idea of how badass these men were. Their most storied mission (which also provides the movie's climactic battle sequence) was the taking of Monte la Difensa located about 10 miles southeast of Cassino, Italy. The German base was situated high atop a mountain with a sheer cliff at their backs as a natural defense against attacks from that side. The slope side was well defended by German artillery and defensive batteries. The American and British conventional forces suffered heavy losses in futile attempts at taking this strategic point. The 1st Special Service Force (or SSF) went in on the sheer side by cover of darkness, climbing the cliffs unnoticed, and nullified the defensive batteries that were uselessly pointing away from their approach. Despite their initial surprise the SSF, under Colonel Robert T. Frederick, suffered heavy losses but took the stubborn mountain base when all was said and done. The elite unit would go on to greater glory in the Italian campaign, used primarily as shock troops to break stalemates. It was at Anzio that they were dubbed "the black devils" from a dead German officer's captured diary in which he wrote, "The black devils are all around us as we come into the line…" It was also at Anzio that the unit started to use their characteristic trademark: a sticker with their unit logo and the words Das dicke ende kommt noch or "The worst is yet to come" emblazoned on them. The men would put these stickers on burned out tank husks and dead Nazi soldiers to wage psychological warfare on their enemies. The unit would eventually be disbanded on December 5, 1944 after seizing the southern French town of Villeneuve-Loubet on August 26 of that same year. The unit's legacy lives on in the Green Berets as the founding father of Army Special Forces, Colonel Aaron Bank, attributed much of their philosophy and training methods to the 1st Special Service Force. Oh, and the movie's pretty good too.